As a team of Falcon family dentists, our practice simplifies the process of caring for your smile without having to drive all over town. At Falcon Dental Care, our highly experienced team makes it convenient to access the dental services that you deserve. Choose from a variety of preventative, therapeutic and cosmetic solutions. We have state-of-the-art sterilisers and equipment to ensure our hygiene standards are exemplary. You can trust Falcon Dental Care to put your health and safety first. Our ultimate goal is to help patients achieve optimal dental health by using effective preventative techniques. Therapeutic cleanings, custom mouthguards and state-of-the-art screening technology allow us to assess concerns in their smallest stages of development. Broken, decayed teeth can impact everything from your confidence to your overall health. We’ll show you how to rebuild your smile with Australian-made custom crowns, bridges or even porcelain veneers to enjoy how your teeth look and feel. Be sure to ask about our dental implants. Avoiding necessary dental care because of anxiety or sensitive teeth can result in disease that’s become more advanced or requires extensive treatment. Our convenient sedation and sleep dentistry options can put your mind at ease. Did you know? Long term Halitosis (or bad breath) is a multi-factor bacterial issue involving over 800 different bacteria in the mouth, throat and sinuses. It can also be worsened by dry mouth. At Falcon Dental Care in Falcon, your entire family is welcome. 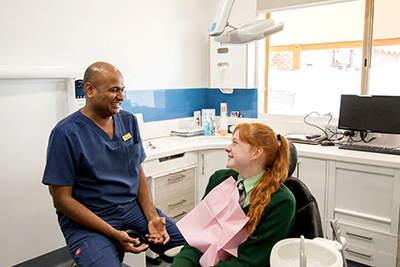 We accept all major health funds, including Veterans’ Affairs plans and the Children’s Dental Benefits Scheme. Contact us today to set up your first appointment with one of our compassionate dentists.